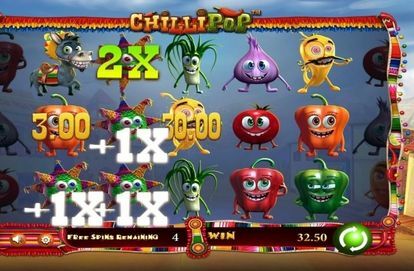 Flavor things up with “Chilli Pop”, cluster-based, cascading slot game with a secret ingredient: an expanding grid offering explosive new ways to win. From the Mariachi soundtrack to the potent red and green chilli symbols, Chilli Pop is immersed with the spirit and sizzle of Mexican cuisine. Players attempt to collect the ideal salsa, coordinating images like tomatoes, onions, garlic, and red, yellow, and green peppers to make the most delectable (and best paying) blends. Like the sauce itself, things can warm up rapidly in Chilli pop. 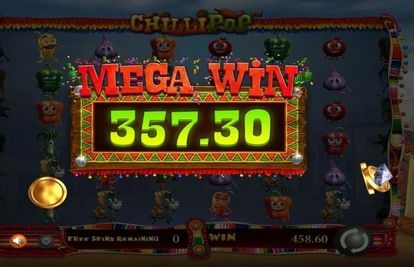 Chilli Pop is a five reel, cluster pay line, 3D slot-game created by Betsoft Gaming. I sat down to play this new casino game offered by BigSpinCasino.com, just to check it out, and next thing I know an hour had gone by and my balance had multiplied by ten. Now I’m not saying this is an experience that will be repeated by everyone; however, I will lay out the specifics of a game that could be one of the most enticing of the New Year. As previously stated, players win money by forming clusters of similar vegetables; from onions and tomatoes, to various types of peppers. The hotter the vegetable, the spicier the multiplier. All cluster wins explode, meaning new symbols drop into place and players are given a chance for additional winnings. The piñatas are the wild symbols. A piñata substitutes for all symbols except for the mule symbol which we are about to talk about. Multiply your wins by the number of piñatas in winning clusters +1. For example, if your cluster nets you 30 dollars, and you have two piñatas on the board, you multiply your 30 dollars by 3 and your winnings amount to 90. 3+ Mule symbols anywhere in view triggers Free Spins. 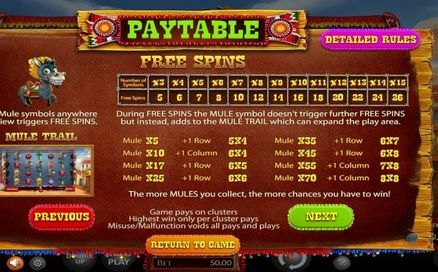 During Free Spins, the mule symbol doesn’t trigger further Free Spins, but instead adds to the “Mule Trail” which can expand the play area. The play area is normally five columns by three rows, but with the Mule Trail can expand up to eight columns by eight rows. Meaning the more mules you collect, the more chances to win. 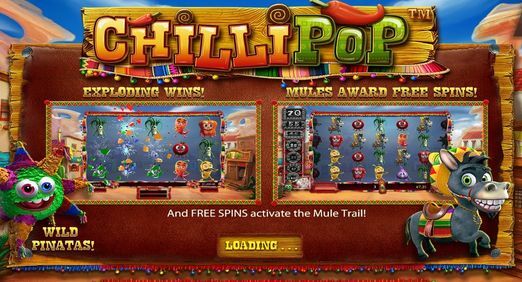 You can also purchase Free Spins if you don’t feel like waiting for the mules. I mentioned previously how I quickly multiplied my balance. Well, all of these winnings were essentially from the Free Spin feature, which was actually triggered much more often than you might imagine. Within the hour that I played, I probably had around ten different opportunities with the Free Spin feature. This 3D game is very sharp and bright, which makes it very visually appealing. I highly recommend this game if you’re into slots, and might even be worth a look if you’re not. Just be sure to keep track of the time or you’ll look up and suddenly it’s 3 AM and you have to wake up in three hours.